Subsite Electronics offers a versatile line of beacons that work with a wide range of Subsite utility locating systems, to help you confidently trace water, sewer and drain lines. Whether you are locating metallic pipe, non-metallic pipe or conduit, we have a beacon to help you easily trace a path or locate blockages. 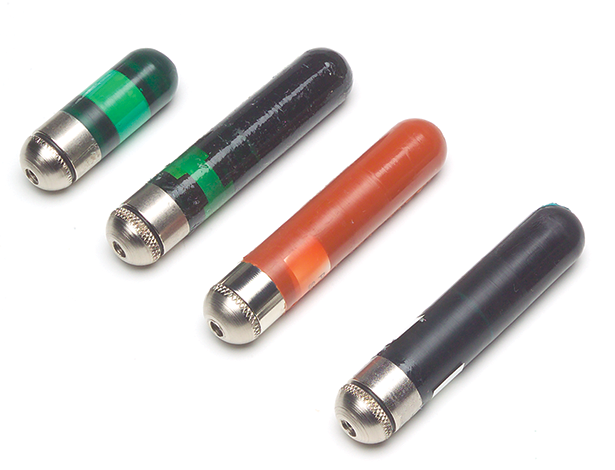 Offering frequencies of 512 Hz up to 33 kHz, the Subsite Electronics 150 water/sewer and conduit beacons provide a solution for every conduit locating application, and can be used with 150, 250, 910, 950 and UtiliGuard® locating systems. We also offer the 910B (512 Hz) and 11B (29.43 kHz) beacons, specifically designed for use in non-metallic pipe and easily attached to a flexible rod or pulled cable. Navigate 45°, 90° and 180° pipe joints up to 1.25" (32 mm) in diameter with ease. 150 conduit beacons provide greater stability in straight pipe up to 1.25" (32 mm) in diameter, due to longer design. 150 short-range water/sewer beacons can trace pipes at ranges up to 12 ft (3.65 m) through non-metallic pipe or 6 ft (1.83 m) through cast-iron pipe. 150 short-range conduit beacons can trace pipes at ranges up to 12 ft (3.65 m) through plastic pipe. 150 long-range water/sewer beacons have ranges up to 30 ft (9.1 m) through non-metallic pipe or 20 ft (6.1 m) through cast-iron pipe. 150 long-range conduit beacons have ranges up to 30 ft (9.1 m) through plastic pipe. 910B(512 Hz) and 11B (29.43 kHz) beacons easily attach to a flexible rod or pull cable assembly for use in non-metallic or ductile iron (910B only) pipes.